Fortunately, my dear guests (who arrived Tuesday), have pretended to turn a blind eye to the chaos for which I can’t thank them enough. In other news, today I’m cooking a turkey for the first time ever. Whoa. I’m a little intimidated. 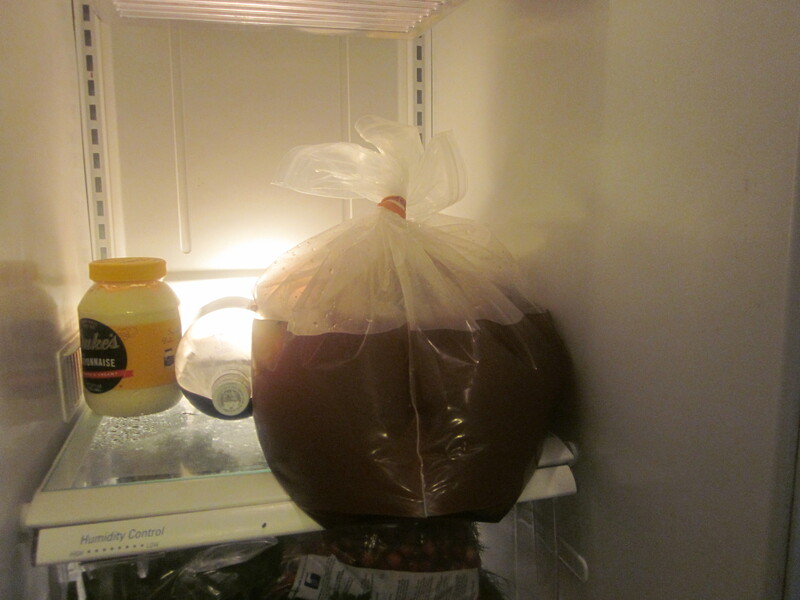 After conducting an enormous amount of Internet research on ways to cook a turkey, I’ve settled on brining it. That’s the bird in the brining bag now. Meanwhile, to the readers who are celebrating Thanksgiving today, have a wonderful day. To the readers who aren’t celebrating Thanksgiving today, I hope your day goes alright too. I’ll write again (soon!) 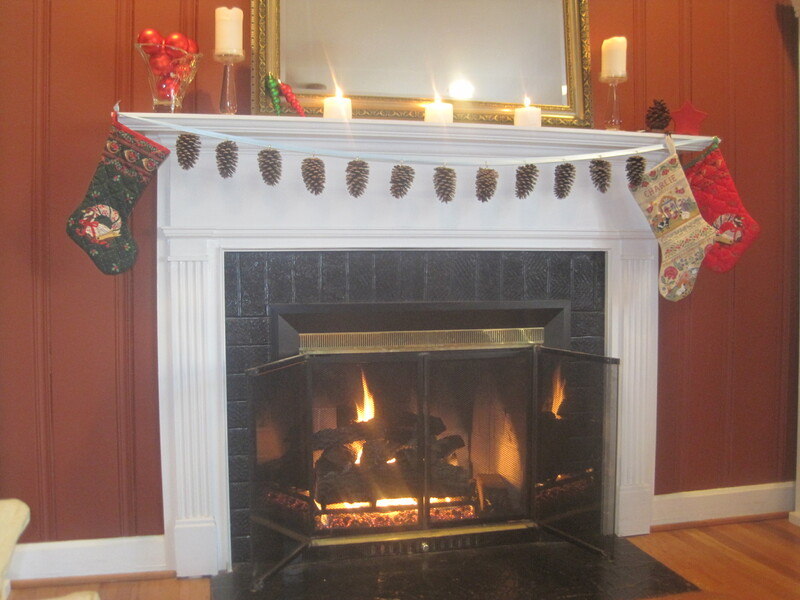 to tell you how the turkey turned out and to give you all the details on the kitchen project. The first year Mark and I lived in this house we planted a Japanese maple (Acer palmatum ‘Bloodgood’) on our wedding anniversary. We spent over $100 on that tree, but it’s been worth every penny. It’s gorgeous and has grown tremendously in the past six years (you can see a photo of it on this previous post). It also remains Mark’s hands-down favorite thing we’ve planted in the yard. Last summer he said to me, “No matter what is going on in my life, when I look at that tree I can’t help but be happy.” Now Mark is not a tree-huggin’, nature-lovin’ kinda guy, so that statement was pretty darn powerful. In fact, it planted the seed (ah, clever pun) for his Valentine’s Day gift this year. The Japanese maple is stunning in the fall; its leaves turn a deep crimson. So when the leaves started changing last October, I began plucking some leaves off the tree and tucking them in a thick book. 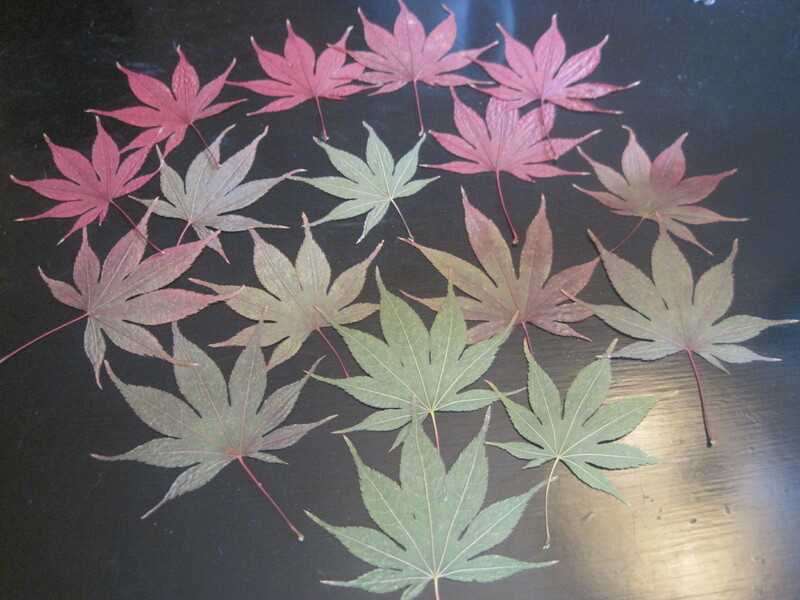 I collected leaves over a few weeks to make sure I had some representing the peak of fall color. Then I just left the leaves alone (or, I “leaved” them alone — I just can’t stop the puns today!) in the book to dry out. 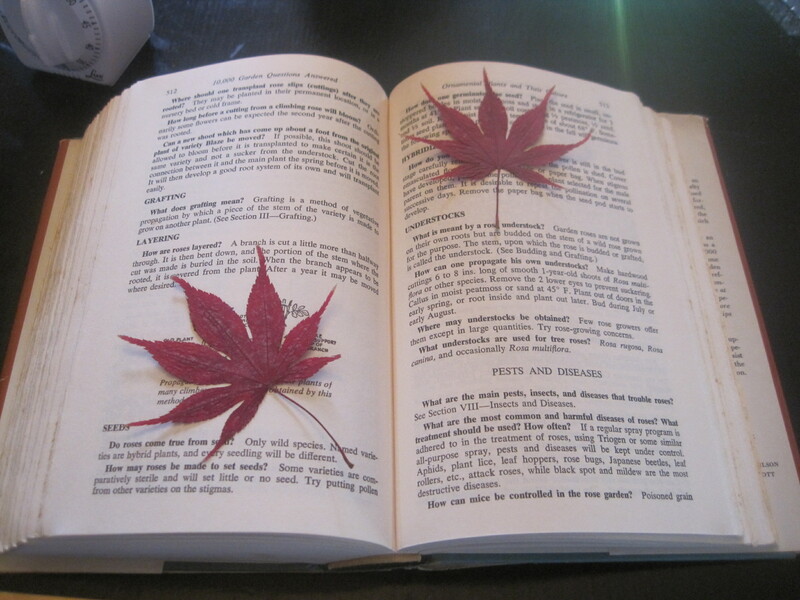 For Valentine’s Day I gathered all the leaves I had tucked away in the book. 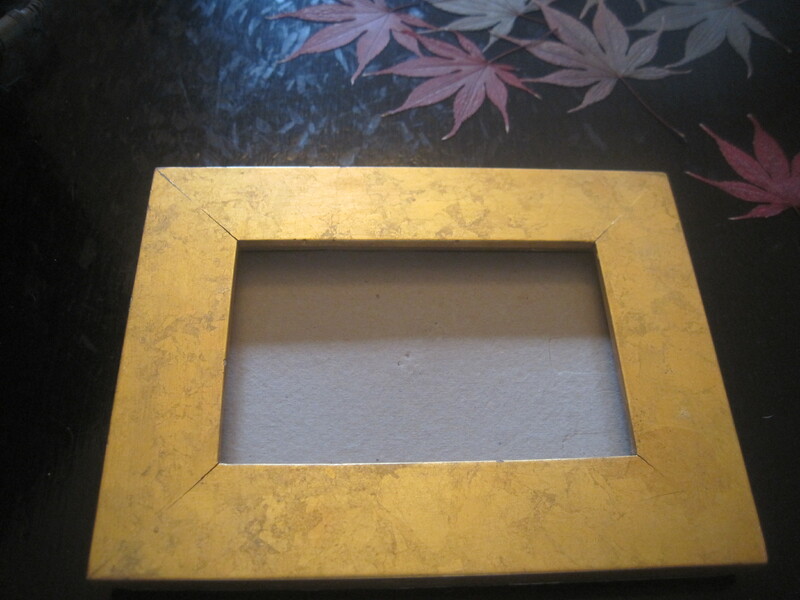 Then I grabbed a frame we already had. 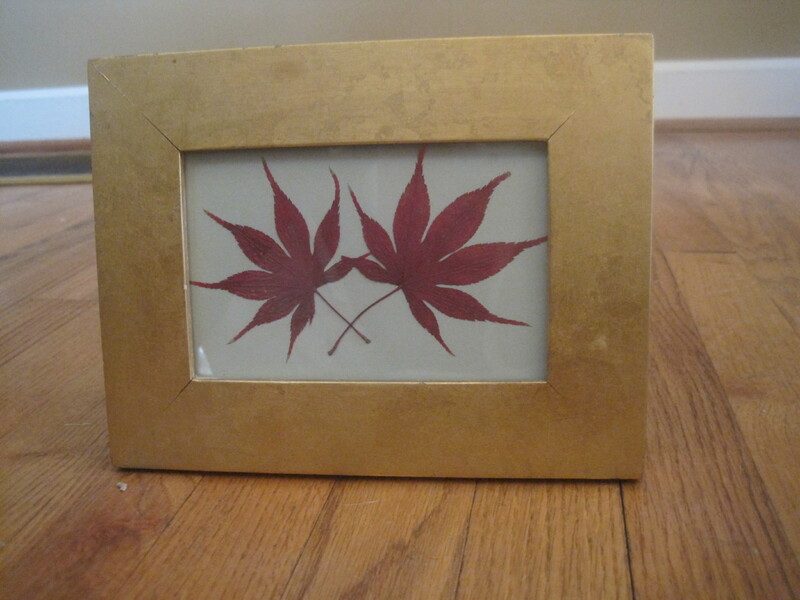 I picked my two favorite leaves, arranged them on the glass, cut some pale green card stock to serve as the background, and put a piece of cardboard behind that so that the leaves were pushed snug against the glass (I didn’t want them slipping). Mark was really touched by the gift. 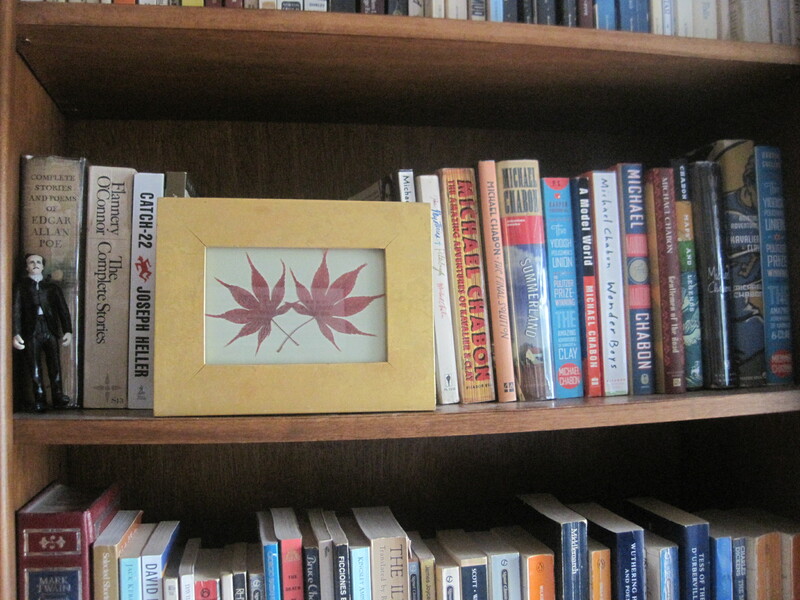 He even put the frame on the bookcase right next to his most beloved collection of Michael Chabon novels and his Edgar Allen Poe action figure. I feel so honored. 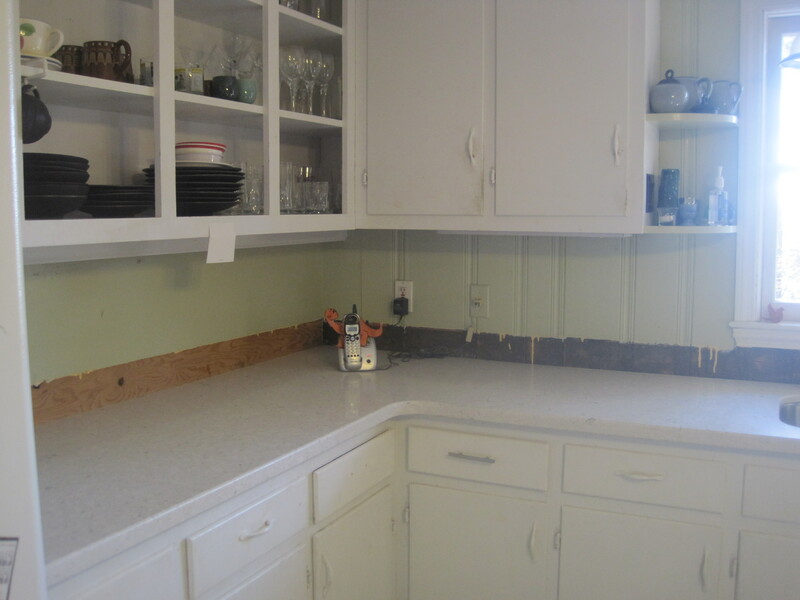 While I love our new backsplash, getting it installed wasn’t without complications. The most obvious of the complications happened when Mark and I forgot to tell the tile guy that part of our kitchen is put together with spit and a smile. Actually, there are areas throughout our entire house that at best are odd, and at worst impinge on our basic quality of life. I’m pretty sure that these “peculiarities” about our house can all be traced back to one set of previous owners who were DIY enthusiasts. Don’t get me wrong, I love a DIYed project, but a potential problem with DIY is that some jobs really are better left to people who know what they’re doing. On the right is wood paneling and on the left, well, it’s a piece of plywood. 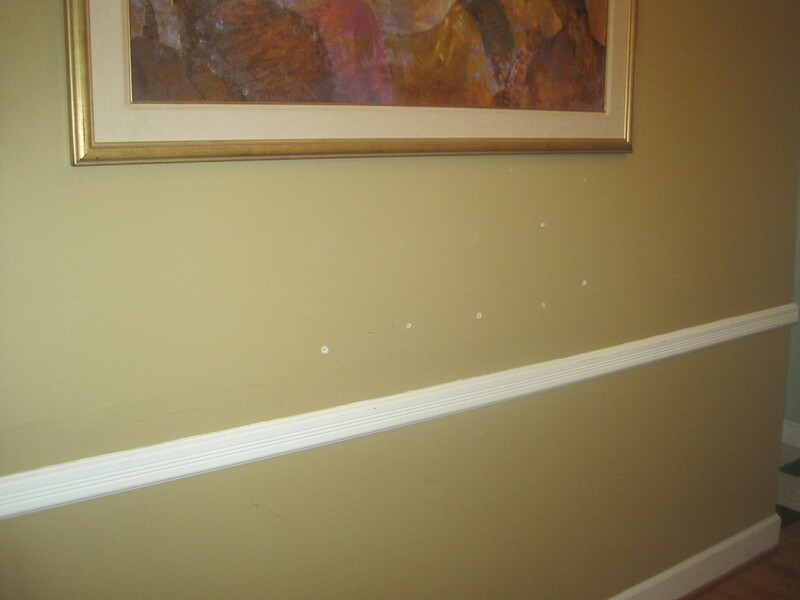 Mark and I wondered why that wall wasn’t like the other four. In fact, it pretty much bugged us. Then one day when Mark was home someone knocked on the front door. An elderly man, accompanied by his daughter, introduced himself as the original owner of our 50+ year-old house and wondered if might he have a look around. Mark invited him inside and gave him a tour. (Here’s a disclaimer. It’s probably not a good idea to let strangers into your home solely on the basis that they claim they used to live there. In this case, however, Mark felt comfortable and all went well.) 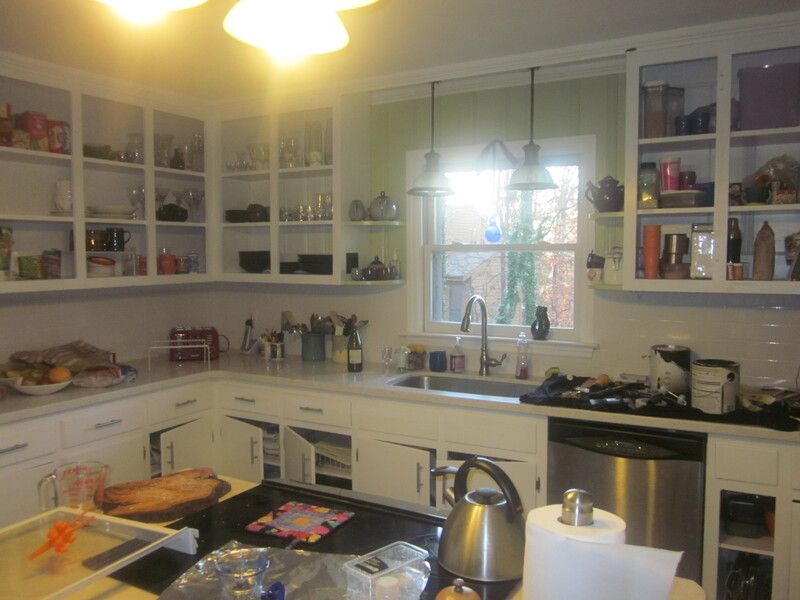 Anyhow, the original owner said that the kitchen used to be open to the dining room underneath the cabinets. At some point, some other owner clearly wanted to close off the two rooms and decided to do so with a piece of plywood. Seriously, how was that the best idea? Surely there was more than one idea for how to separate the two spaces and in what world is, “Hey, let’s just put up plywood and paint it?” the winning idea? The tile guy was mortified. After apologizing profusely (and in response we apologized to him for not remembering this goofy little detail of our house), he said, “Wow. I’ve never seen anything like that.” And that, I assure you, was not meant as a compliment. Fortunately, Mark and I had all the tools on hand to fix the torture device, so we told the tile guy not to worry about it. 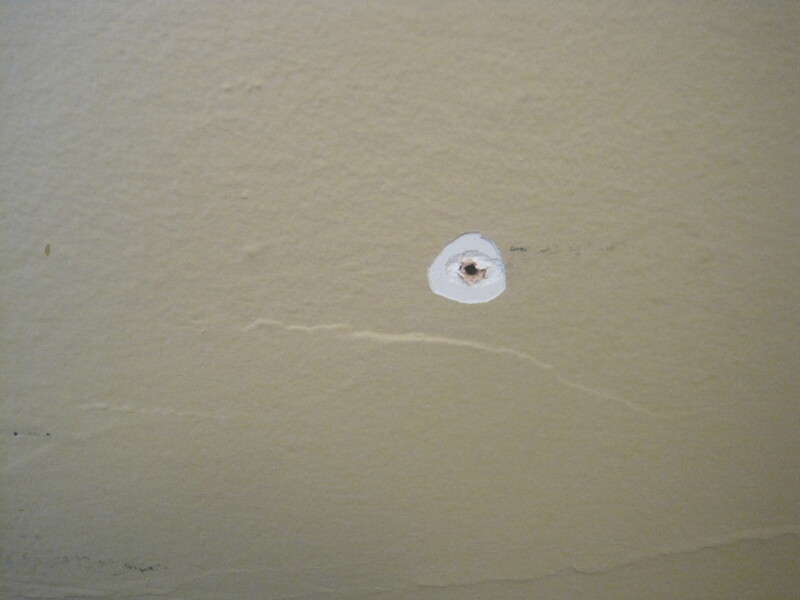 We just filled the holes with spackle, let it dry, and then sanded the spackle to ensure a smooth surface. Then we just touched up the entire area with the original wall paint we still had in the garage. Good as new. And now that the wall in the kitchen is tiled, no one would ever guess our plywood secret. It’s been awhile since I posted a blog entry. I went on vacation for Thanksgiving and although I was only physically gone a few days, I obviously have been mentally still on vacation for quite some time. But I’m back now (for the most part). I made The List. Oh, The List. I thought this list of inexpensive (many even free) tasks I’ve been meaning to get to around the house would be inspiring, but instead it’s just a reminder of all the things I haven’t done. 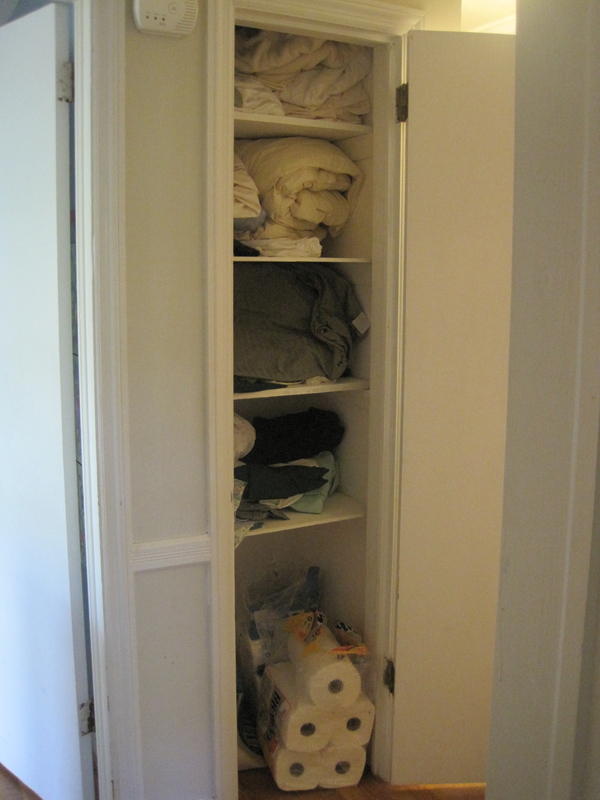 One of the items on the list is to clear clutter in ALL of the closets in the house. Good grief. I may never finish that task. One closet seems like a major accomplishment. So although the list is intimidating, it does on occasion cause brief, productive bursts of guilt inspiration. My mom, who does more in a day than I seem to get done in a week, came to visit and helped me. Just one half of one episode of this horrific program on TLC called “Hoarding: Buried Alive,” sent me running to the nearest cluttered area to atone. Have you seen this show? Sweet mercy, it is terrifying. No joke. This is how it is described on their website: “Hoarding goes inside the homes of extreme hoarders to explore the psychology behind their compulsion to accumulate & store large quantities of nonessential things.” Enough said. Anyhow, I attacked two different closets. First up: the catch-all closet in the front hall. 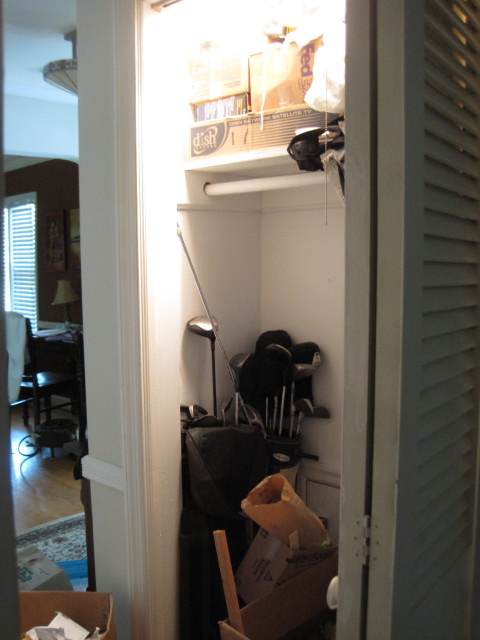 This closet had become our behind closed (closet) doors dumping ground since shortly after we moved in. It had no order to it, we just shoved things in there that we couldn’t find a home for elsewhere or that should have gone to live in the garage but we were too lazy to take to the garage. It had gotten to the point where we’d open the closet door and things would tumble out. Sorry, the picture of this closest isn’t good because it’s in a tight space in the house and it’s impossible to get a good angle on it for a photo. 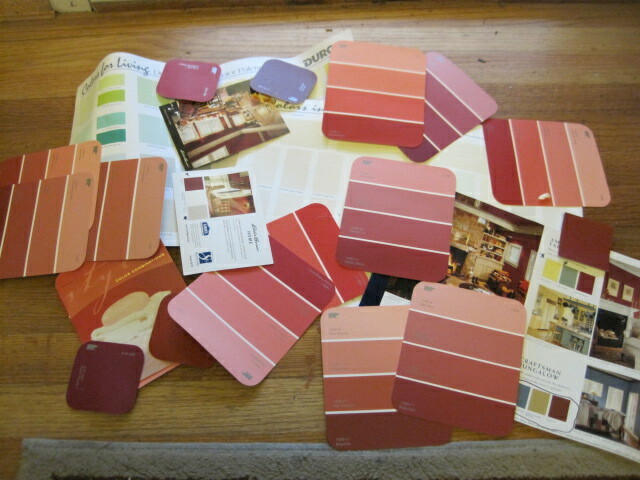 And, in fact, none of those large paint chips are for the color we actually ended up choosing. I think we ended up with the red color that’s circled in the bottom right of the photo. I think. 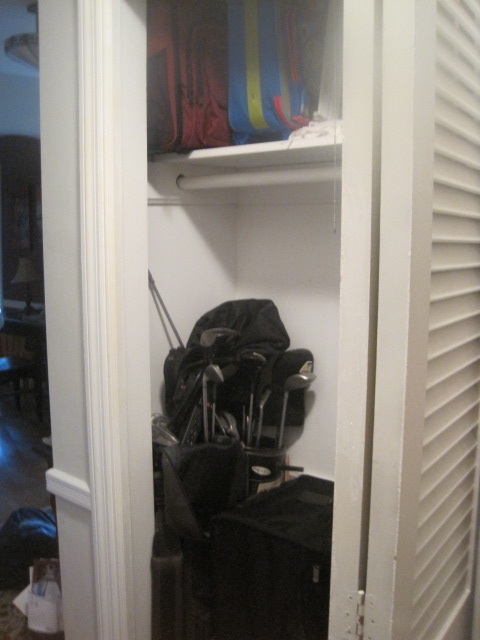 Now the closet stores luggage and golf clubs, both of which get used at about the same rate which is to say almost never. 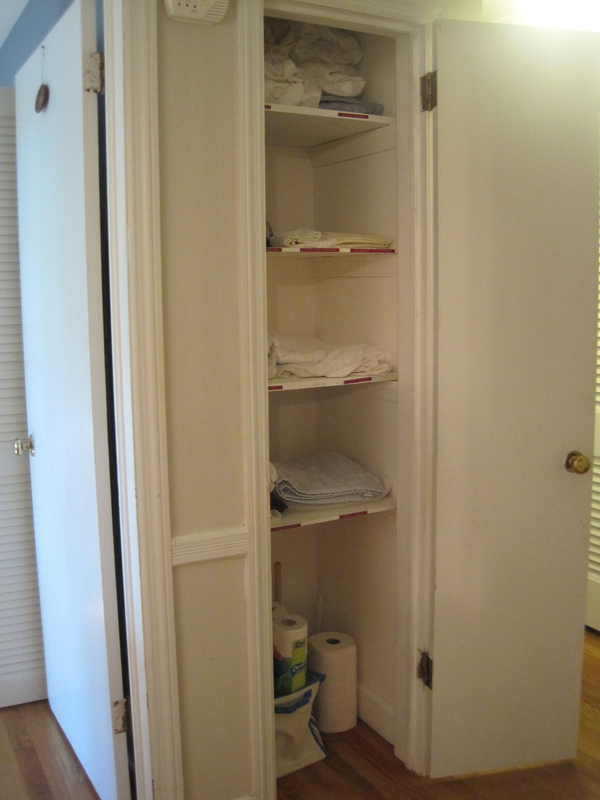 Next up, the linen closet. This one wasn’t nearly as cluttered as the hallway closet, but it lacked any form of organization and I’d lost track of what was in there. This is the closet my mom helped me with. 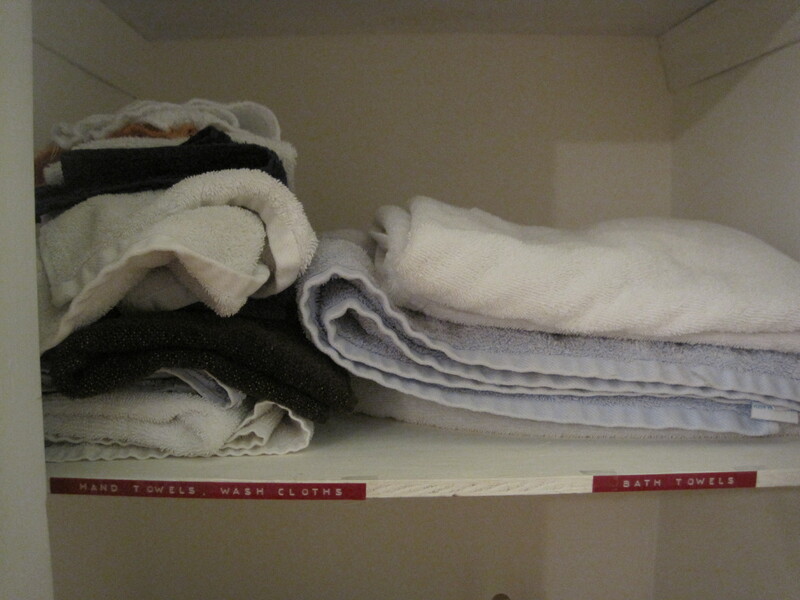 We took everything out of the closet and created lots of piles to sort each item, including piles for twin sheets, queen sheets, duvet covers, hand towels, bath towels, and wash cloths. We also made the ever-important “thrift store” pile which, I’m happy to report, was quite large by the time we were finished. I’m even happier to report that my mom took the big pile of things to the thrift store and brought back a receipt for tax deduction purposes. 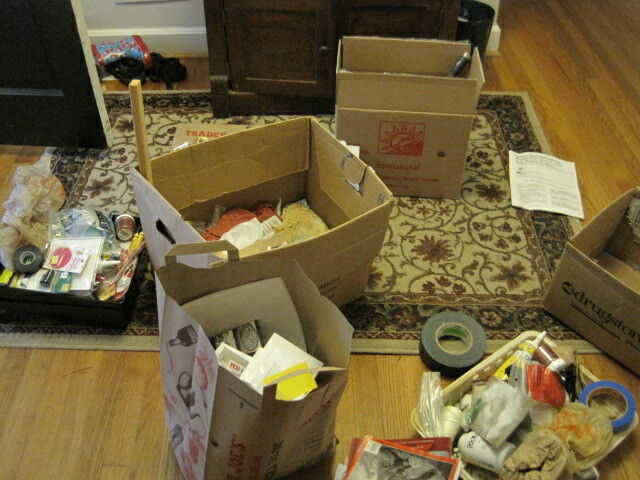 Then we put everything that remained back into the closet, keeping each item in its sorted pile. My mom even went all Ms. Organization on me and, after she flew home, created a bunch of labels and mailed them to me, so now I’ll always know where things go. Thanks, Mom! I still have a long way to go on my quest to clear clutter in the house — heck, I have a long way to go just to clear clutter in the rest of our closets — but little by little, I’m working on it. Or, at least, I’m thinking about working on it. 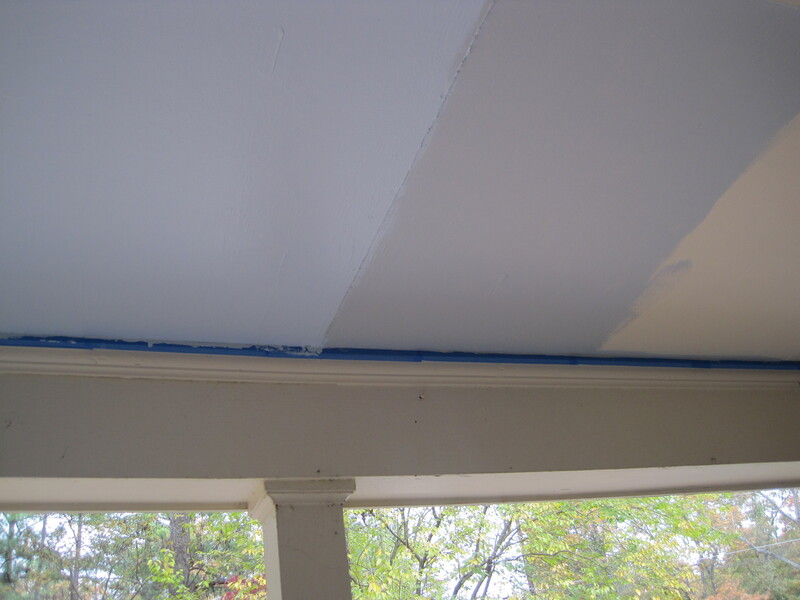 I set a goal for this past weekend to paint the porch ceiling blue. Technically, the goal was to paint the ceiling the previous weekend, but after a small setback in which I chose a shade of blue (Serene Sky by Behr) that was all wrong for the house, I had to postpone my efforts until this past weekend. Actually, if I’m going to be completely honest, I really set the goal to paint the porch ceiling blue many weeks ago when I the made The List — 20 tasks to do around the house, each costing less than $20. But when I created The List, I didn’t put a date on any of the “to do” items, so I really wasn’t behind on the porch ceiling project until last weekend. Armed with a quart of Cloudy Day by Behr, I set to work Saturday morning. 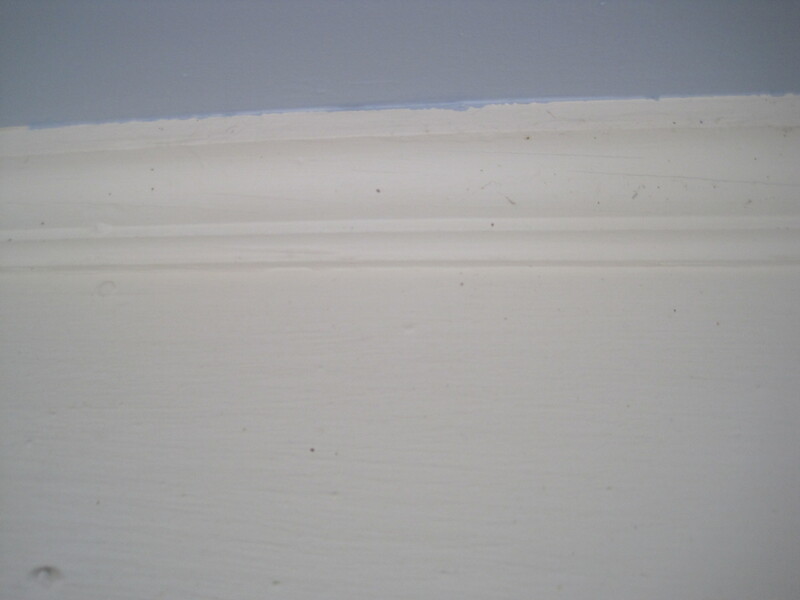 I applied blue painter’s tape around the edges of the porch where the ceiling meets the molding. Then I took a brush and cut in around the painter’s tape. After that was done, I used a roller brush to roll the paint onto the ceiling. I got about three quarters of the first coat done when I ran out of paint. So in the middle of my project, Mark, Charlie and I drove to Home Depot to get more paint. 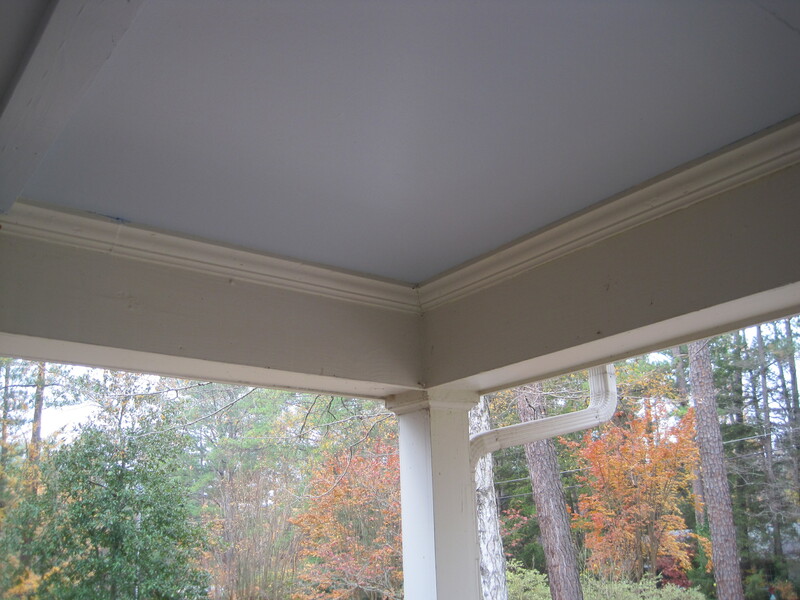 Running out of paint was particularly distressing because I’d hoped to paint the porch ceiling for under $20 and I’d already gone over budget after wasting money on the quart of the way-too-cheery Serene Sky. This, people, is why they make testers of paint. I could have bought one for Serene Sky, in fact, I thought about buying one but I decided not to because I didn’t want to spend the $3 or whatever relatively small amount it cost. Silly, silly me. Anyhow, off we went to buy more Cloudy Day. I knew I could finish the ceiling with two more quarts, but the price of two quarts was only a couple of dollars less than a gallon, and Mark said he liked the color of Cloudy Day so much that he might want to use it on other projects, so a gallon of the stuff came home with us. 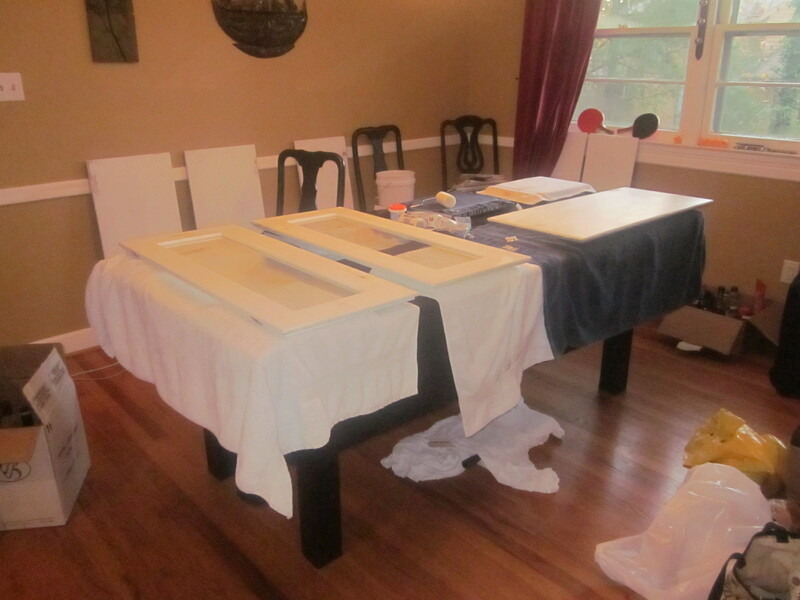 I finished painting the first coat of Cloudy Day and got to work on the second coat. That’s when Mark couldn’t stand it anymore and took over. 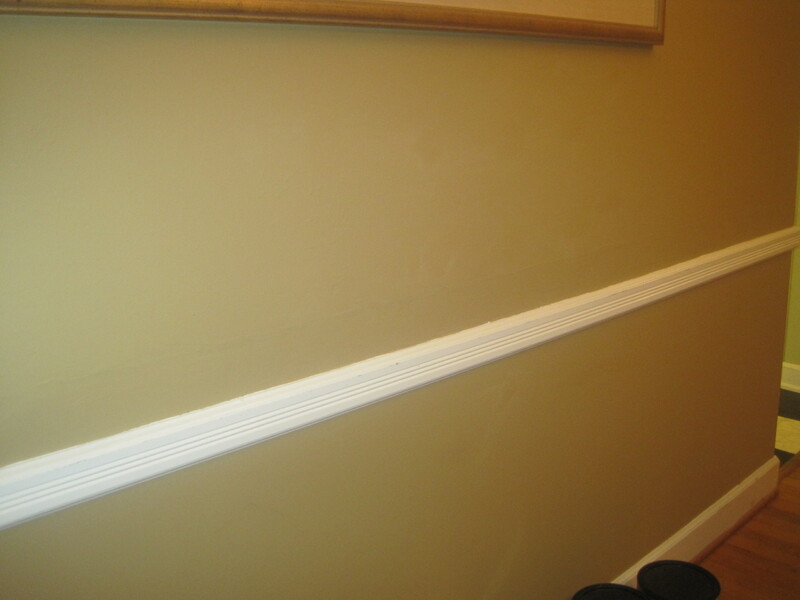 Mark used to be a professional house painter. He’s very, very particular about painting. The fact that Mark hadn’t shown much interest in the porch ceiling project until he ultimately took it over was a little, uh, odd to me. At some point in the middle of the first coat, when he came out and started giving me unsolicited advice, I asked him why he wasn’t insisting on painting the ceiling himself. He replied, “I’m trying to learn to let go.” Alrighty then, I kept painting. I don’t think I’m a bad painter, but I will never be as good a painter as Mark. So by the time I got around to rolling on the second coat of paint, Mark had watched my efforts for long enough. He finished up the porch ceiling while I played with Charlie and tried not to interfere too much. While I’m happy with the ceiling, I’m not happy that I went over the $20 budget. In fact, you may be wondering just how far over budget I went. Hmm, not even close to $20. So how did I go so terribly wrong? First, I should have sprung for the tester in Serene Sky rather than buying the quart outright. Second, once I had settled on a color — Cloudy Day — I should have just bought a gallon rather than hoping that a quart would be enough. To my credit, however, I did use a paint calculator tool which estimated that I only needed about a quart. Granted, I knew my measurements probably weren’t exact since the calculator is based on painting four walls rather than a ceiling, but I figured I was close enough. Third, I didn’t choose an inexpensive paint. 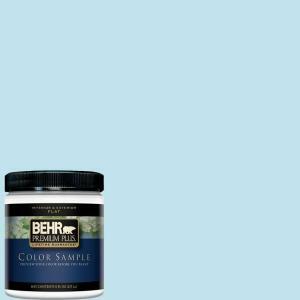 Behr offers a basic exterior paint that would have saved me several dollars, but I bought the paint that has the primer built in thinking it would save me a step. 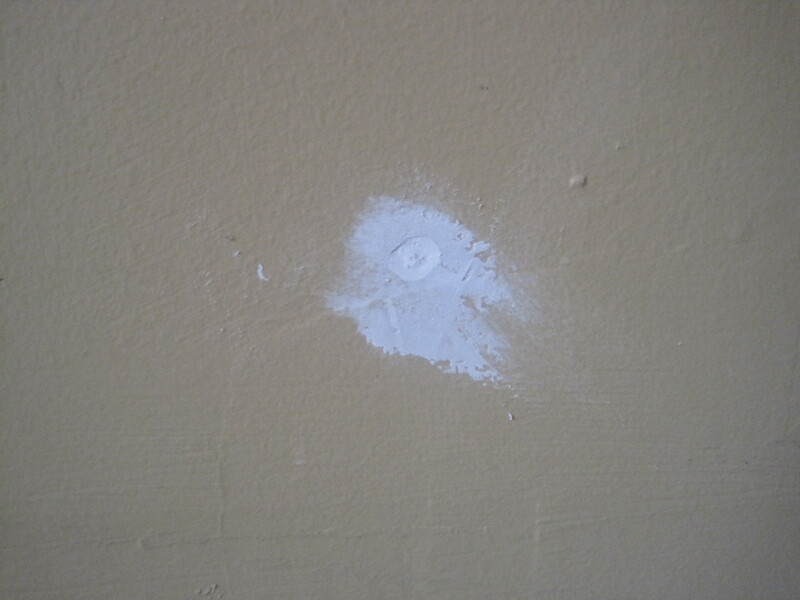 Maybe it did, but maybe I also could have just used the less expensive exterior paint and not bothered priming. I’ll never know. Finally, I bought the small roller brush (and I used it for this project), but we had two larger roller brushes at home I could have used instead. Had I just bought a couple of tester jars (one for Serene Sky and one for Cloudy Day), and had I bought a gallon of Cloudy Day to begin with, and had I properly checked our supplies at home before I went to Home Depot, my total costs would have probably been about $40, still much more than the $20 I’d hoped for, but a lot less than what I did spend. I probably wouldn’t have noticed this, but Mark sure did and that’s all it took for him to announce, “We’re going to have to repaint the whole porch.” To be fair, the porch needed to be repainted even before my ceiling mishaps, but the mishaps have provided a sense of urgency that Mark hadn’t felt before. So I guess repainting the porch will be the next project at Casa Yikes Money. I’ve already started looking at different shades of tan. But this time, I’m investing in some tester jars. This past weekend I pledged to tackle one of the tasks on my daunting To Do list. 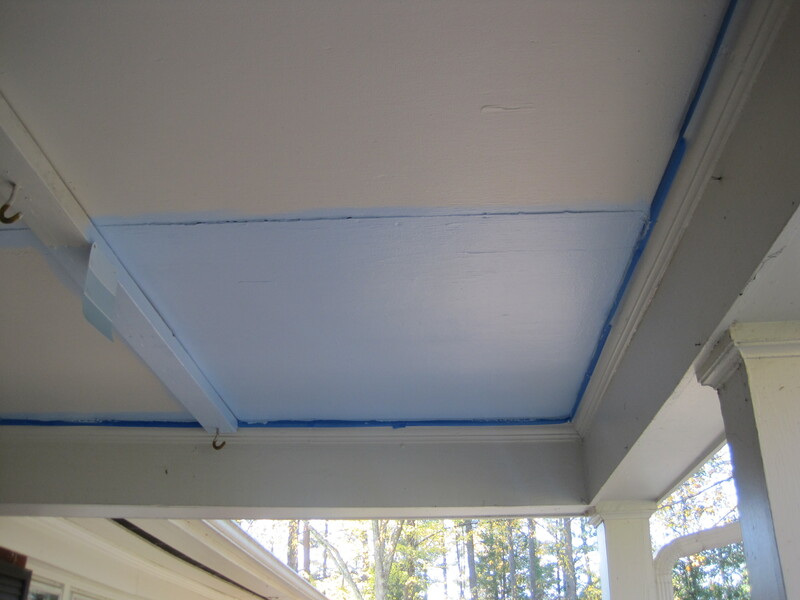 I’ve been meaning to paint the porch ceiling blue for quite some time. Blue porch ceilings are a bit of a Southern tradition that reportedly comes with benefits – they’re said to keep wasps and spiders from taking up residence in the corners of the porch (which would be awfully nice given the wildlife that seems to be attracted to our porch) and blue porch ceilings are also said to keep away evil spirits. I don’t know how much time I spend worrying about evil spirits, but if a blue porch ceiling keeps them away, then I suppose that’s an added bonus. (This is totally off topic, but not long after we moved into our house one of our neighbors asked us how we were settling in and then asked if the house was haunted. Say what?! I replied no and then asked why she had asked. She said, “No reason.” Uh, yeah, right. I’m still trying to find out what she knows about this house that we don’t.) Anyhow, the porch. I decided to paint it blue simply because I thought it would be fun and different. I did a lot of online research trying to find recommendations for exactly which blue paint to use. I was hoping to see pictures of blue porch ceilings with accompanying notes like, “The ceiling is painted in Sherwin Williams’ Ice Blue.” Or, “I painted my porch ceiling in Olympic’s Lotsa Blue and it is stunning.” Or ideally something like, “Never use anything but Benjamin Moore’s Blue Porch Ceiling for your porch.” Unfortunately, I couldn’t find any guidance so I was pretty much on my own. 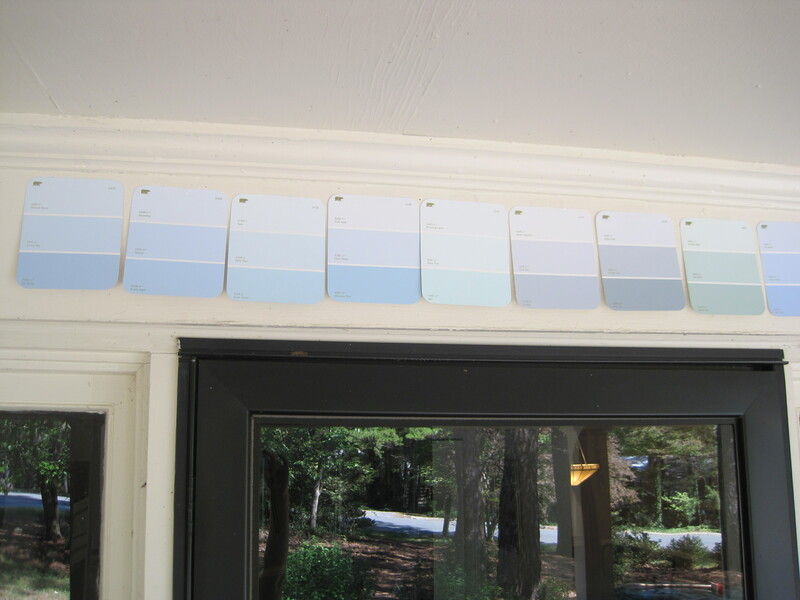 As I mentioned in Friday’s post, to help me decide on a color, I gathered a heck of a lot of Behr paint chips and taped them up on the porch near the ceiling. I’d really like to say that I wasn’t heavily influenced by the name of the paint, but I was. I mean, come on, who wouldn’t want their blue porch ceiling to appear like a serene sky? So off I went to Home Depot to get a quart of Serene Sky in exterior paint (with primer built-in) in satin finish. 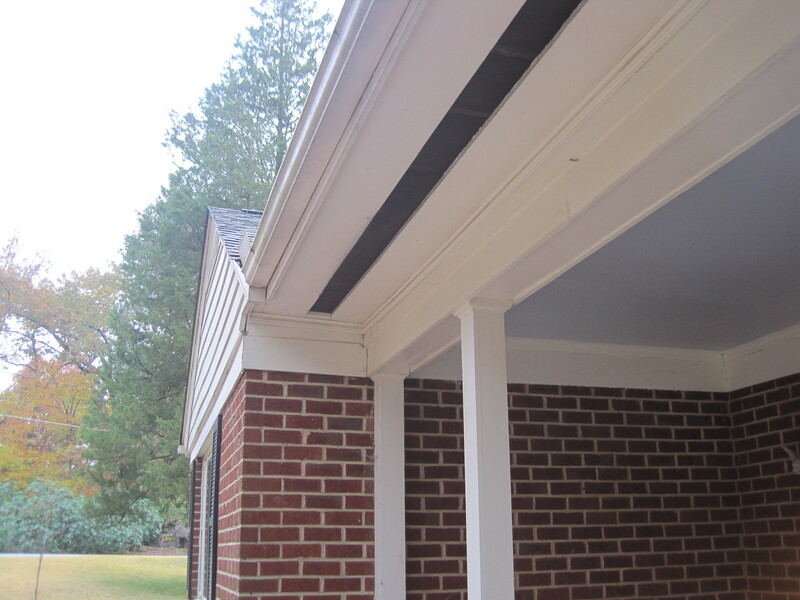 Several weeks passed, and I decided that this weekend would offer the fantastic weather to paint the porch ceiling. We had a glorious weekend, perfect for outdoor projects. On Saturday morning, I gave the entire ceiling a good scrubbing with a sponge dipped in warm soapy water. I let it dry for several hours. 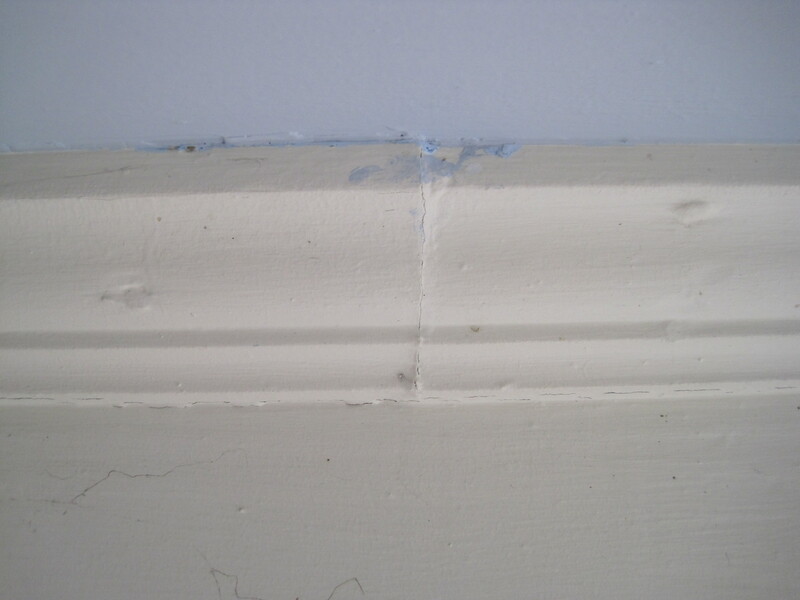 Then I put up some painter’s tape around the edges of the porch and broke out the paint and paintbrush. It didn’t take me more than a few brushes of the paint to know I didn’t like the color. I asked Mark for his opinion and he was equally unenthusiastic about it. We decided to paint a big chunk of the ceiling in two coats of the Serene Sky just to give it a good chance to grow on us. But it was obvious that Serene Sky was just a bit too, well, cheery for us. I’m not sure how to describe it other than too cheery. It’s not that it was a bad color, it’s just that it looked completely out of place on our house. So we gathered all the other paint chips I’d collected and sorted through them again. 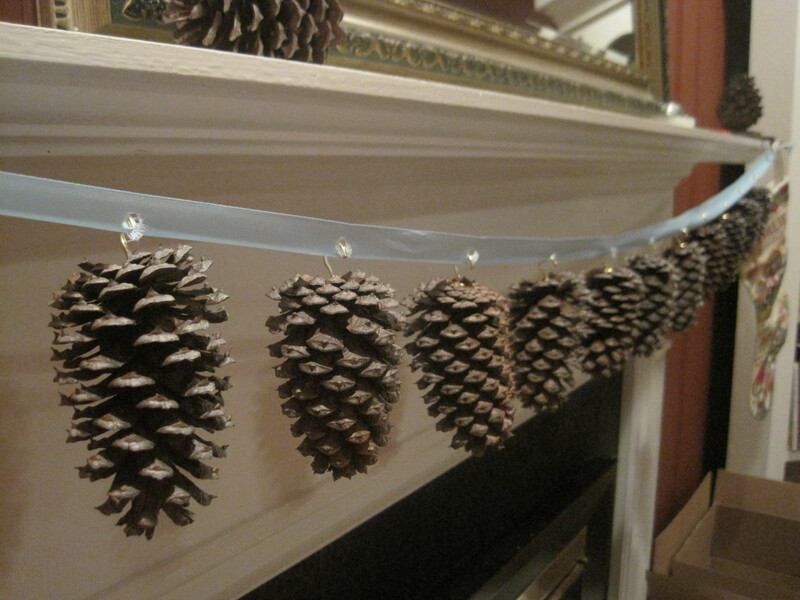 This time, we were drawn to the grayer blues since Serene Sky had taught us that we’re not really cheery blue people (and our house turns out not to be cheery either). We narrowed it down to two alternatives: Cool Sky and, good grief, a color called Cloudy Day. Cool Sky was nice, but it seemed pretty darn close to Serene Sky. Over and over, our eyes kept being drawn to Cloudy Day. But could we really trade Serene Sky for Cloudy Day? Really? I am endeavoring to reform my pessimistic tendencies, but choosing Cloudy Day over Serene Sky just seemed like throwing in the towel. In the end, I just had to admit that I’m more a Cloudy Day kinda gal than I am Serene Sky. So yesterday morning we headed back to Home Depot and bought a quart of Cloudy Day. Holding my breath, I painted a big block of Cloudy Day on the porch ceiling right next to the Serene Sky block to see how we liked it. The result: it was so much better (although I fully realize that the picture below doesn’t do justice to the incessant cheeriness of Serene Sky versus the subtle warmth of Cloudy Day). But by the time I had painted just the test block of Cloudy Day, most of the afternoon was shot so I still haven’t finished painting the front porch ceiling. While I’d like to finish painting as soon as possible because it really looks awful at the moment with two big blotches of blue (and one of them is the way too cheery Serene Sky), I am not sure when I’ll be able to get to it. Hopefully next weekend’s weather will be as nice as this weekend’s, filled with a serene sky and not a glimpse of a cloudy day. Oh, wait. 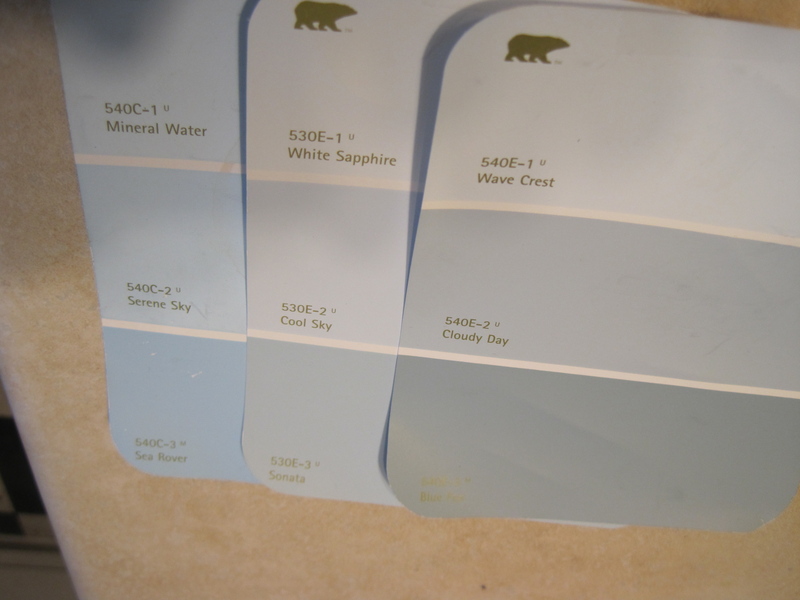 *Photo of Serene Sky paint chip taken from Home Depot’s website, found here.